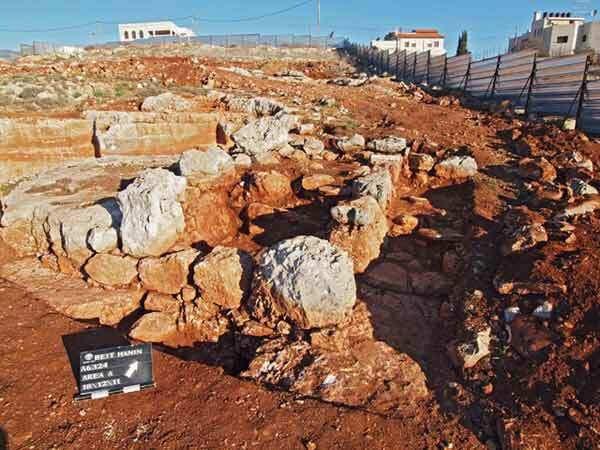 In November–December 2011, a salvage excavation was conducted in the Beit Hanina neighborhood of Jerusalem (Permit No. A-6324; map ref. 221100–250/637625–775), prior to construction. 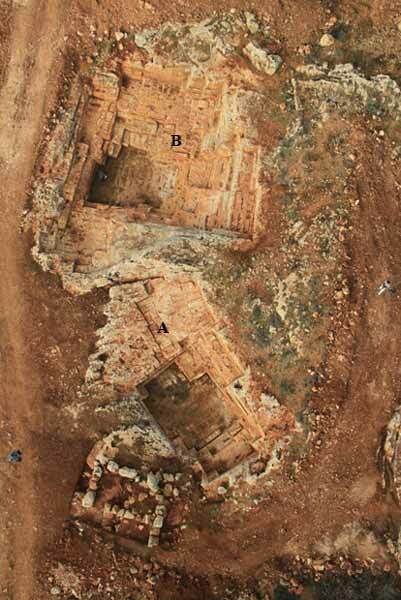 The excavation, undertaken on behalf of the Israel Antiquities Authority and financed by the Jerusalem municipality, was directed by I. Zilberbod, with the assistance of N. Nehama (administration), A. Hajian, M. Kahan, B. Antin and M. Kunin (surveying and drafting), A. Peretz (photography), the Sky View Company (aerial photography), I. Brin (plans), S. Ilani and T. Minster (geological consultation), G. Bijovsky (numismatics), I. Lidsky-Reznikov (drawing of finds) and C. Amit (studio photography). 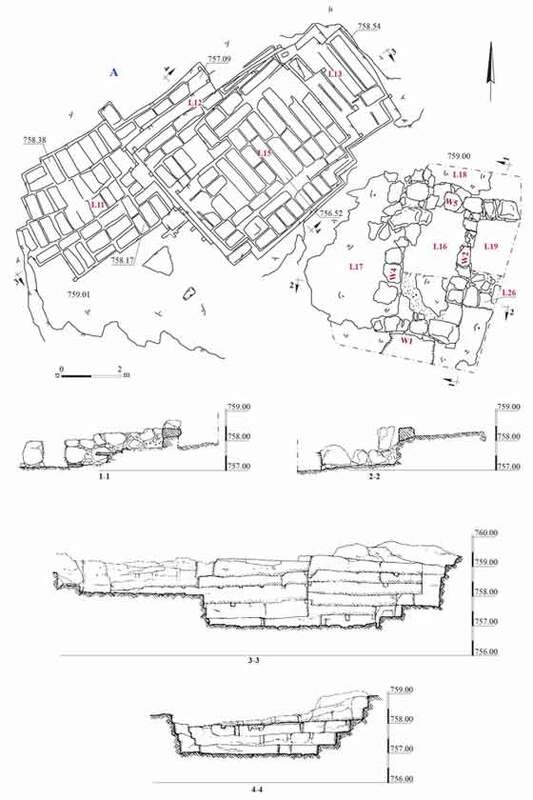 The excavation area (c. 50 dunams, elevation 750–770 m asl; Figs. 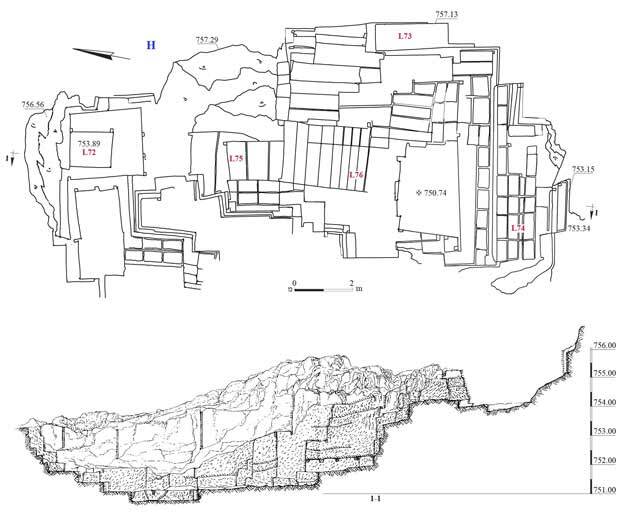 1, 2), extending across an east–west spur, revealed nine quarries (A–I), a building and a wall delineating a dirt road. The quarrying was carried out in limestone of the Bi‘ana formation from the Turonian epoch. There were two rock units of this formation in the excavation area. The lower unit is called melekeh, and is similar to the Shivta Formation that appears in the Negev and the Judean Desert. This is a hard, dense, bioclastic white or light-colored type of limestone that is coarsely crystalline and occurs in thick layers (1–3 m thick). The upper rock unit is called hilu and resembles the Nezer formation, also present in the Negev and the Judean Desert. 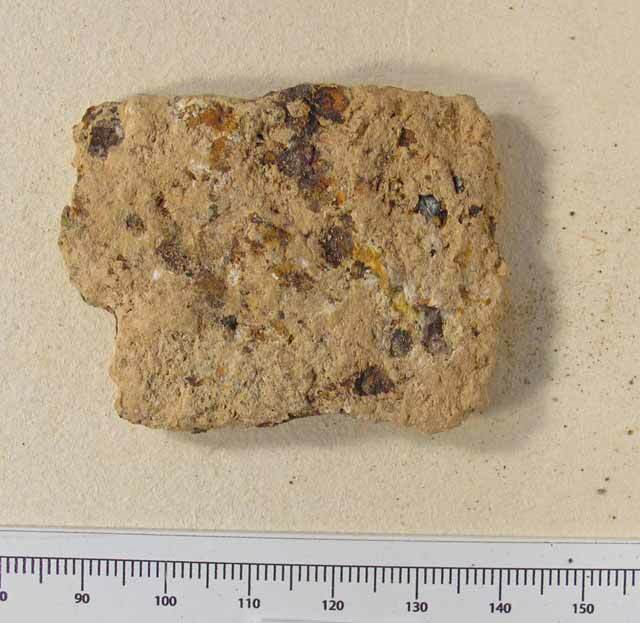 This is a limestone rock unit that is light gray, thinly crystalline, biogenic, hard and dense (mizzi hilu); it occurs in thin layers (0.1–0.4 m thick). 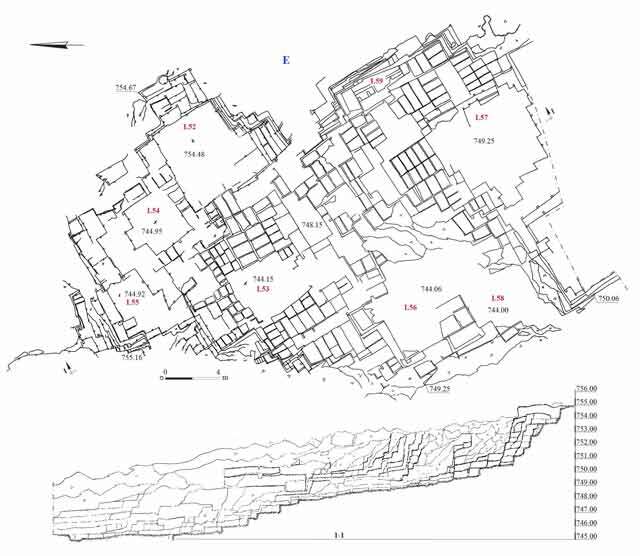 The quarries in the northern part of the excavation area were small (A–C, G, I) and hewn directly into the hilu rock on the surface. 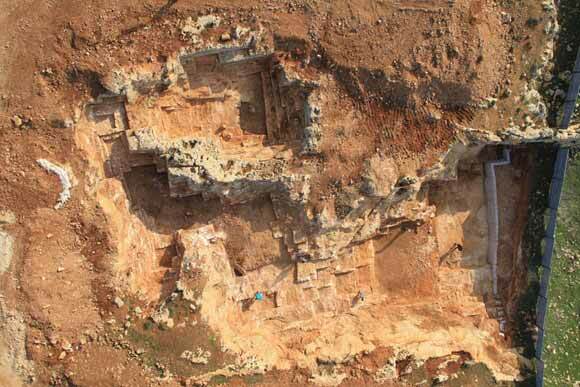 In the southern part of the excavation, the quarries were large and deep (D–F, H), as the surface rock (thickness c. 1 m) was removed to allow the quarrying of the melekeh rock below it. The geological strata in the melekeh unit were generally inclined toward the east. The ashlars were removed from the large quarries in a north–south direction, perpendicular to the stratigraphic inclination of the rock. The large quarries were open to the south to facilitate the removal of stones. 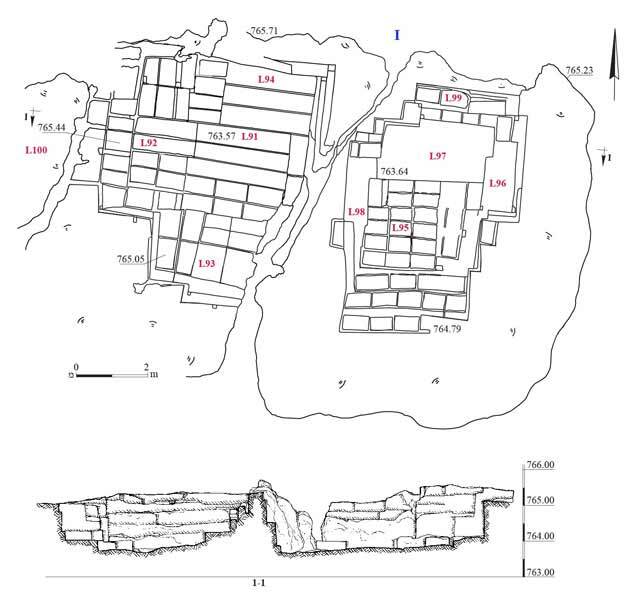 Three of the large quarries (E, F, H) and two of the small ones (A, B) were almost entirely excavated; several of the quarries were found exposed on the surface. In some of them there was an accumulation of dark brown soil and fieldstones of various sizes, which overlay a layer of quarrying debris. 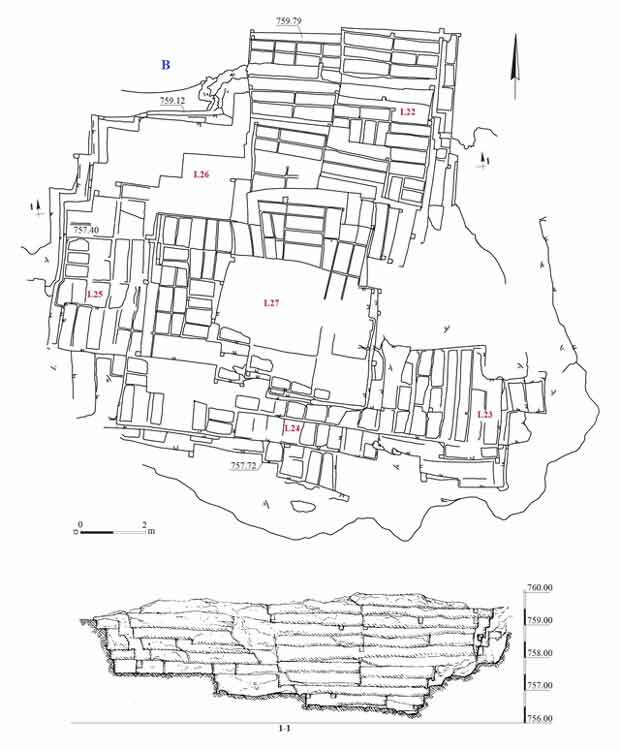 Other quarries were previously discovered c. 500 m southwest of the excavation area (Zilberbod 2012) and c. 500 m to its north (Zilberbod 2013). Quarry A (c. 6.5 × 13.5 m, depth c. 2 m; Figs. 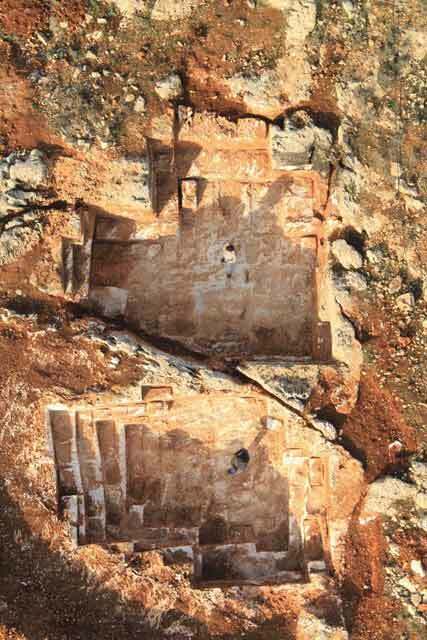 3–5) was rectangular, with four or five quarrying steps (each c. 0.4 m deep) on three of its sides (L12–L14). A wide, deep quarrying step (L11; c. 4 × 4 m, depth c. 1 m) was exposed next to the western side of the quarry. There was no opening in the quarry for removing stones. Quarry B (12 × 14 m, depth c. 3.5 m; Figs. 4, 6, 7) was square, with five to eight quarrying steps on all sides. There was no opening in the quarry for removing stones. Quarry C (9 × 21 m, depth c. 5 m; Figs. 8–10) was rectangular, with six quarrying steps. Quarrying negatives were discerned, indicating that several stones (c. 0.5 × 0.7 m) were produced in the quarry. There was no opening in the quarry for removing stones. Quarry D (14 × 15 m; Figs. 9, 11) was large, and extended westward, beyond the excavation limits. Four to six quarrying steps were uncovered. The southwestern side of the quarry (L47) was opened to facilitate the removal of stones. Quarry E (25 × 40 m, max. depth 10 m; Figs. 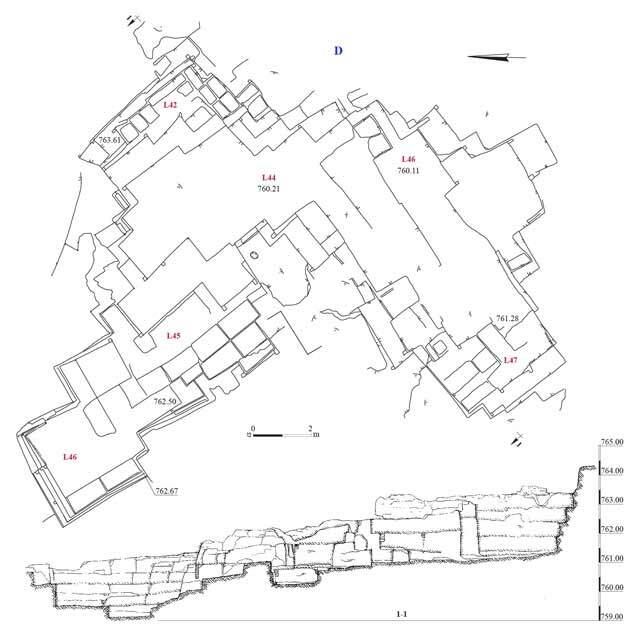 12, 13) was an extensive quarry that consisted of six clusters of rock-cuttings (L52–L57) connected by hewn passages. Six to ten quarrying steps were uncovered on all sides. Stones were removed out of the quarry through an opening (L58) on its southwestern side. Evidence of mechanical drilling was discovered in the southern part of the quarry, indicating that this area was also quarried during the modern era. Quarry F (Figs. 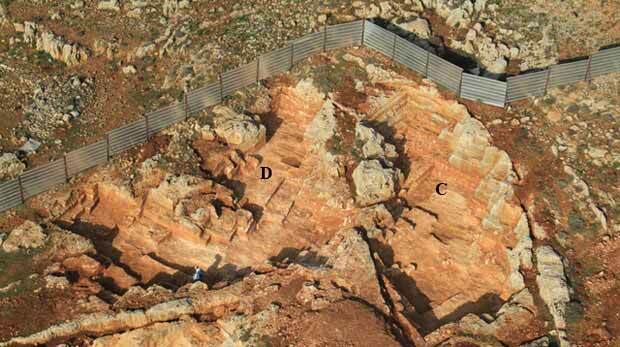 14–16) was an extensive quarry, comprising five clusters of rock-cuttings (L62–L64, L66, L69). 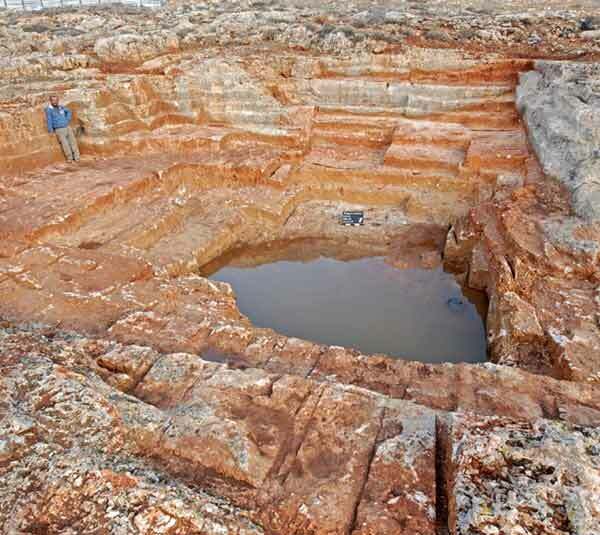 A raised bedrock surface (L65) in the center of the quarry had three–four quarrying steps. The two southern steps (L66, L69) were large and deep (max. depth 12 m) and open to the south, whereas the three northern ones were smaller and open to the north. Quarry G (8 × 8 m, depth c. 3 m; Figs. 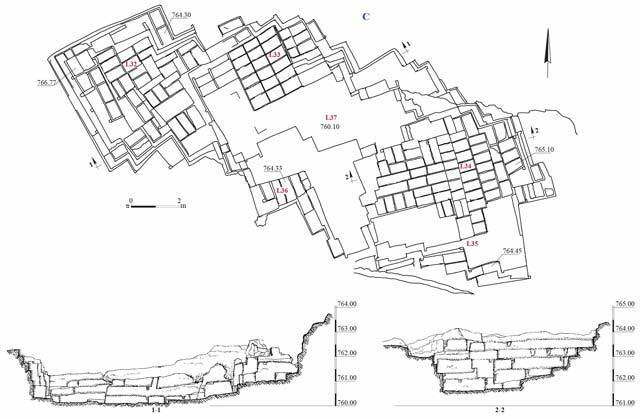 17, 18) was small and square, with several quarrying steps. 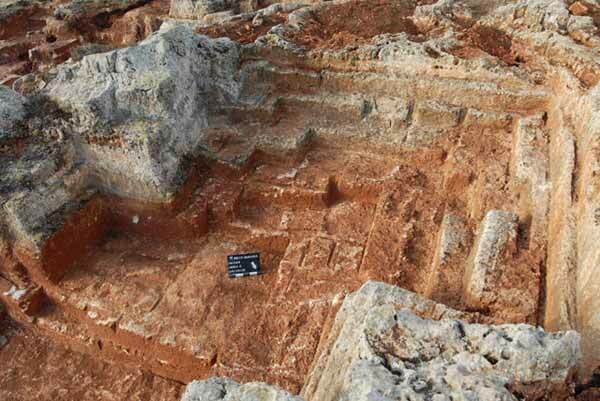 The negatives of quarried stones (0.5 × 1.0 m, c. 0.5 × 1.5 m) could be discerned on the quarry’s floor and on its steps. Signs of mechanical drilling were noted on the western wall of the quarry. The ancient steps were evidently removed due to modern quarrying activity. Quarry H (c. 10 × 18 m, depth c. 5 m; Figs. 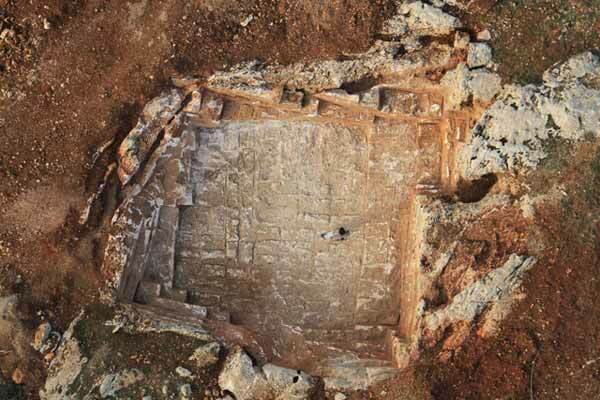 16, 19, 20) was rectangular, with several quarrying steps. The quarrying negatives of rectangular stones of various sizes were discerned where the rock-cutting was carried out. Numerous signs of modern mechanical drilling were discovered on the western side of the quarry. The quarry was opened to the south to facilitate the removal of stones. Quarry I (Figs. 21, 22) was located near the top of the spur. It comprised two deep, adjacent clusters of rock-cuttings (L91—c. 8 × 8 m, depth c. 3 m; L97—c. 6. × 7, depth c. 2.5 m). The quarrying was carried out directly on the surface. 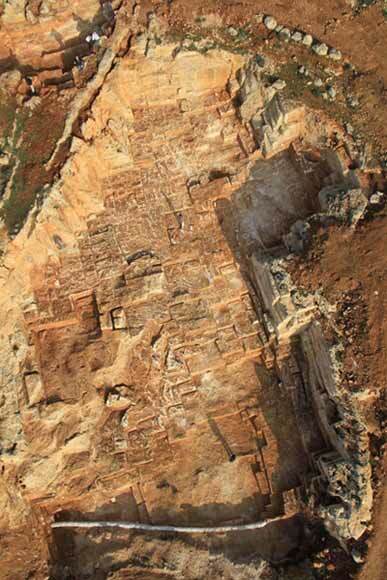 Five quarrying steps (each c. 0.5 m deep) were discovered on the quarry’s sides. No steps were discovered in the eastern wall of Cluster 91 due to karstic weathering of the bedrock. Many severance channels (width c. 0.5 m, depth c. 0.25 m) were discovered on the quarry's floor. Building (Figs. 3, 4, 23). 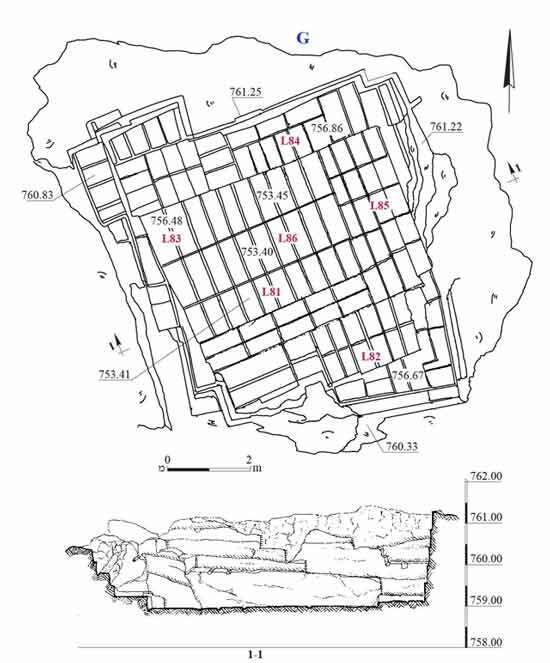 A rectangular building (c. 3 × 4 m) whose walls (W1, W2, W4, W5) were constructed of a single row of large and medium fieldstones was discovered next to Quarry A. 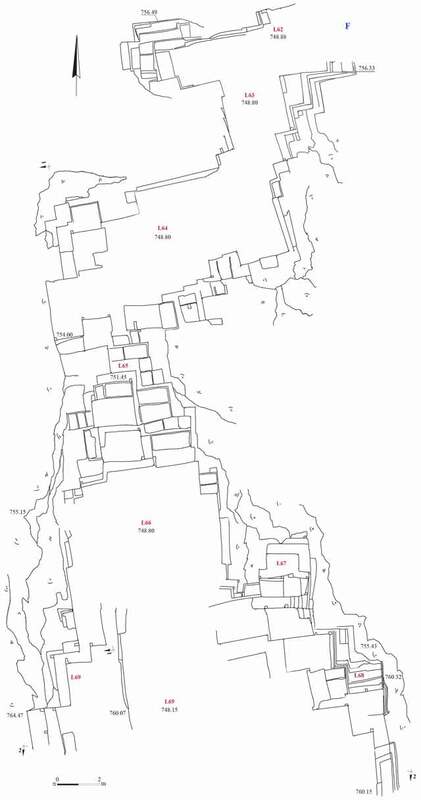 Walls 1, 4 and 5 were built on the bedrock, whereas W2 was constructed on stone slabs that were used to level the area (L26). The walls were preserved to a height of 0.5–1.5 m. An opening (width c. 1 m) was exposed next to the southeastern corner of the building. 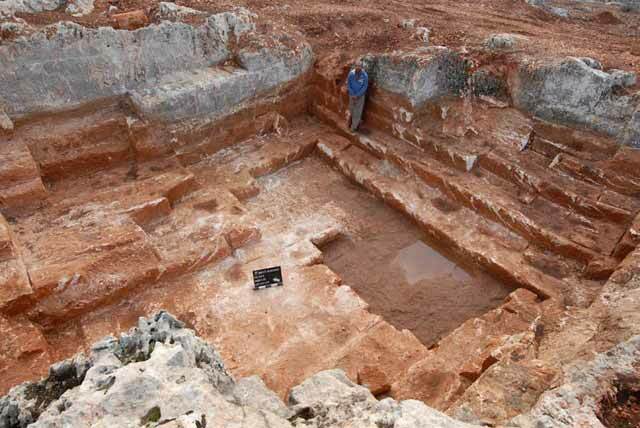 A leveled layer of tamped earth (L16) was discovered inside the building, above the bedrock. The structure was apparently used as a field tower at the time when the quarries were in use. Wall (W1; length c. 35 m, width c. 0.5 m, height c. 0.5 m). An east–west wall, built of a single row of large fieldstones and set on the bedrock, retained the southern side of a road (width c. 2 m). The road was delimited on the north by a natural bedrock terrace. A layer of tamped earth and small stones deposited on the bedrock was exposed along the road. It seems that the road was used for transporting stones from the quarries. Pottery sherds from the Early Roman period were discovered in the layers of quarrying debris. These included a bowl (Fig. 24:9), cooking pots (Fig. 24:11, 12), jugs (Fig. 24:14–19) and juglets (Fig. 24:20–22). A bowl (Fig. 24:10) and a cooking pot (Fig. 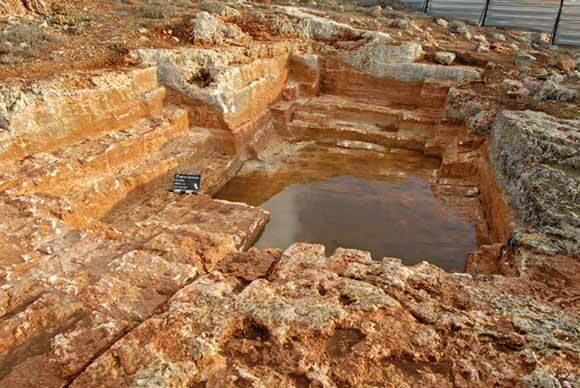 24:13), also from the Early Roman period, were found inside the building. A coin of a procurator from the time of Claudius (54 CE; IAA 146295) was discovered in a severance channel in Quarry E. A metal plate (c. 0.5 × 6.0 × 8.0 cm; Fig. 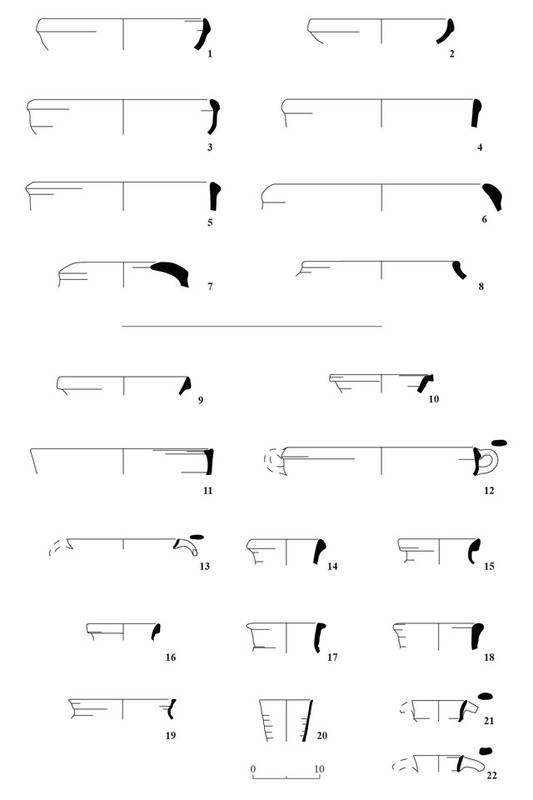 25), belonging to a two-plated wedge used for quarrying, was discovered in Quarry F. When detaching a stone from the bedrock, the wedge would be inserted between two such plates, referred to as lekhayaim, which increased the pressure on the stones and reduced the wear of the wedge set between them. Late Iron Age pottery—bowls (Fig. 24:1, 2), kraters (Fig. 24:3) and jars (Fig. 24:4–8)—were found in two stone clearance heaps adjacent to Quarry I. Based on the finds recovered from the quarries, the quarrying activity began in the Early Roman period. Sherds from the late Iron Age, discovered in the stone clearance heaps, are probably indicative of activity during this period, but have no relation to the quarries. The differences between the large and small quarries, specifically the structure of the quarries and the size of their stones, stem from the differences in the rock in which the quarrying was conducted. Signs of mechanical drilling discovered in several of the quarries show that they were also used in the modern era. 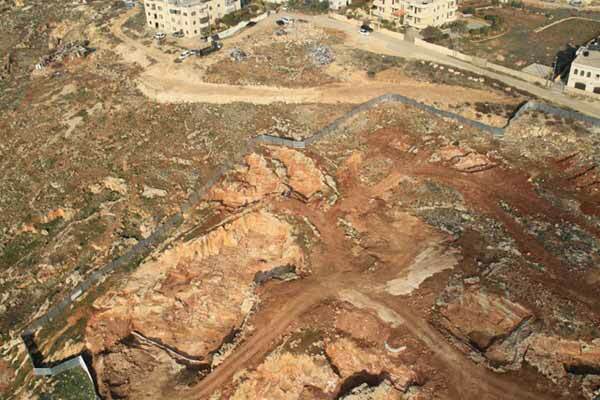 The quarries found in the current excavation augment the numerous quarries previously discovered north of ancient Jerusalem. 2. The excavation area, aerial view looking northwest. 3. Quarry A and the building, plan and sections. 4. Quarries A and B and the building, aerial view looking west. 5. Quarry A, looking northeast. 6. Quarry B, plan and section. 7. Quarry B, looking north. 8. 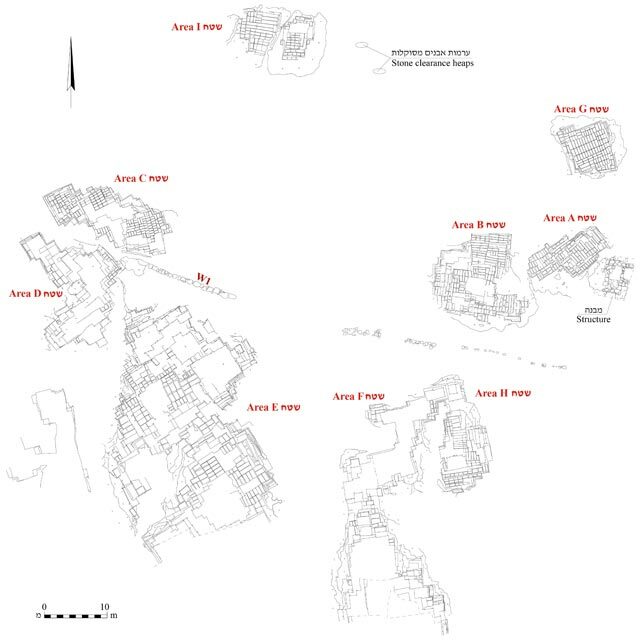 Quarry C, plan and sections. 9. Quarries C and D, aerial view looking west. 10. The western end of Quarry C, looking southwest. 11. Quarry D, plan and section. 12. Quarry E, plan and section. 13. Quarry E, aerial view looking north. 16. Quarries F and H, aerial view looking east. 17. Quarry G, plan and section. 18. Quarry G, aerial view looking west. 19. Quarry H, plan and section. 20. Quarry H, looking southeast. 21. 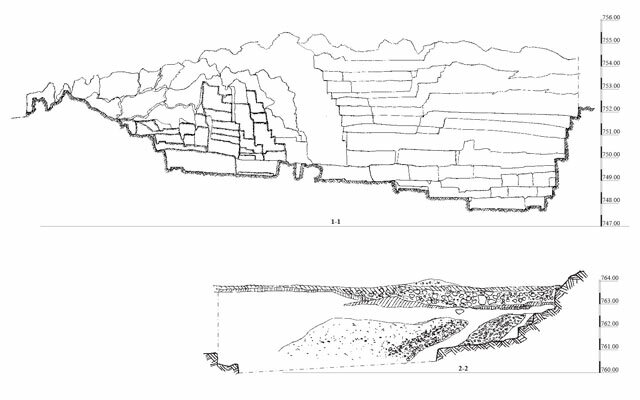 Quarry I, plan and section. 22. Quarry I, aerial view looking west.